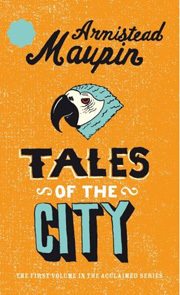 [Shears] is helping to pen a musical to Armistead Maupin’s ‘Tales of the City.’ Since his pal, Jeff Whitty, sent him a note asking him what he thought of the books a year ago, Shears has been coming up with ideas and melodies. Background: This isn’t the first time the “Tales” characters have been musicalized. Another Jake, with the surname Heggie, composed an opera entitled “Anna Madrigal Remembers” (with libretto by Maupin himself) which revisited the adored transsexual landlady. Fun cocktail party trivia fact: both Shears and Whitty worked as go-go boys before establishing themselves. This entry was posted in Music, The Gays, Theatre and tagged adaptations, Armistead Maupin, Jake Shears, musicals, Tales of the City. Bookmark the permalink. @Christopher — Yeah, Jake definitely has the right style and sensibility to pull off an adaptation. As does Whitty. Should be fun! Let’s hope it gets done. I’m jumping down, all alone in my living room, wait that’s sort of depressing… No I just read this again and I’m jumping up and down!!!! I am happy I found your website on orkut. Thanks for the sensible critique. Me and my friend were just preparing to do some research about this. I am glad to see such good info being shared freely out there. I m really wishing I could write about ladyboy as you do , please post more you have a fan here!